Radiation therapy uses carefully targeted and regulated doses of high-energy radiation to kill cancer cells. Radiation causes some cancer cells to die immediately after treatment, but most die or become incapacitated as a result of the radiation-induced damage to the cancer cell’s chromosomes and DNA. Radiation oncologists work closely with medical oncologists, surgeons and other doctors to coordinate the most appropriate care for you. Experience and advanced technology. Erode Cancer Centre’s radiation therapy services combine the quality and capability of state-of-the-art equipment with the expertise and compassion of the medical staff. Specialized skills. Each radiation oncologist has specialized training in performing radiation treatment for people with cancer and those with certain noncancerous (benign) conditions. The doctors further specialize by concentrating their individual practices on treating different types of cancers, including complex and rare cancers. This specialized expertise ensures precision treatment and improved outcomes. Treatment tailored to your needs. Erode Cancer Centre’s radiation oncology professionals tailor treatment to your needs. After the radiation oncologist identifies the areas to be treated, radiation is directed to the cancerous tumors to minimize the dose of radiation to normal tissues. Comprehensive cancer center. Erode Cancer Centre meets strict standards for a National Cancer Institute comprehensive cancer center, which recognizes scientific excellence, a strong research program and a multidisciplinary approach to cancer prevention, diagnosis and treatment. The Medical Oncology department provides excellent in-and out-patient and day-care facilities. The department deals with the systemic therapy of cancer including chemotherapy, hormonal therapy, targeted therapies, supportive care and bone marrow transplantation. Our experienced team, trained in best institutes in the country and abroad, uses chemotherapeutic drugs to treat various cancers. Medical oncology improves the efficacy of surgical and radiation oncology when cancer is diagnosed early. In an advance stage, it improves the quality of lives of patients and prolongs survival. During the treatment patients are given chemotherapy drugs in the form of tablets and injections. The treatment is given once in a few weeks for a period of time depending upon the condition of patients and the nature of cancer. 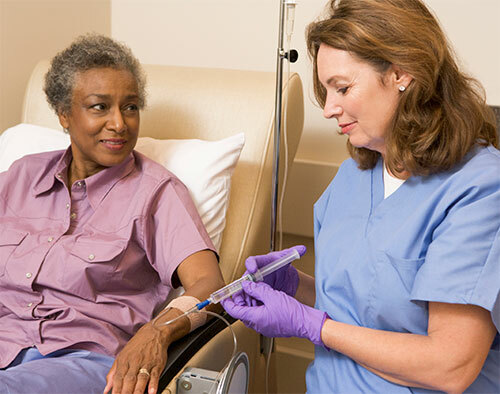 Prior to starting with the treatment, all side-effects of chemotherapy are managed through pre-medications. The department is equipped with the most advanced chemo-delivery technology and equipment to make the experience easier and better for patients. We make sure patients complete their drug cycles within the prescribed time-limit and move to the next level of treatment according to the plan. We keep ourselves updated with the latest drugs, procedures, and innovations in the field of medical oncology to give best possible care to cancer patients. We also have patient-friendly facilities like pain management and supportive care clinic at the hospital to serve our patients better. Surgery is used to diagnose, stage and treat cancer, and certain cancer-related symptoms. At Erode Cancer Centre(ECC), our experienced surgeons have performed thousands of procedures and will discuss the surgical options that are best suited to your individual needs. Pain & Palliative care is care for adults and children with serious illness that focuses on relieving suffering and improving quality of life for patients and their families, but is not intended to cure the disease itself. It provides patients of any age or disease stage with relief from symptoms, pain, and stress, and should be provided along with curative treatment. Pain & Palliative care may delivered by oncology doctors and nurses, they may ask for the help of a specialized team of doctors, nurses, and other specialists who work with them to provide an extra layer of support addressing the patients’ needs and helping patients and their families have a voice in realizing their treatment goals. Pain & Palliative or supportive care is given throughout the cancer experience, whenever the person is having symptoms that need to be controlled. This can be from the time of diagnosis until the end of life. It’s appropriate at any age and at any stage in any serious illness. Pain & Palliative or supportive care is also about giving patients options and having them take part in decisions about their care. It’s about assuring that all their care needs are addressed – their physical, emotional, spiritual, and social needs.